Prescriptive pluralism is the idea that a multiplicity of faiths and cultures is not just an observable fact in the modern world, but something which is right. All religions ought to be promoted as equally valid. This is the approach adopted by politically correct multiculturalism. On the surface it sounds good. But the corollary is taken to be that therefore any group which claims to have ‘the truth’ in such a way that other faiths are deemed untrue or wrong is not to be tolerated. We all want to see people of different cultures and faiths living peacefully together. But this outlook would want to legislate restrictions on what people, especially Bible-believing Christians, are allowed to believe and publicly declare. Inevitably it comes into collision with those who believe in Jesus, who said: ‘I am the way, and the truth and the life. No one comes to the Father except through me’ (John 14.6). There is a vast amount which could be said about what is wrong with prescriptive pluralism, but let me simply indicate three fatal flaws in its logic. Multiculturalism often promotes itself under the banner of being ethnically and religiously sensitive. If you, perhaps as a Christian, give your view of a subject you will be smiled at paternalistically by the politically correct person and told: ‘Well, that is just your perspective’. The implication is: ‘You are biased, but I am not’. But actually the whole exercise is biased. It is biased towards Western secularism, which is the mother of political correctness. ‘All cultures are equal’, we are told. But the question is: ‘Who says so?’ Does a Muslim believe that? Does a Hindu not believe that her way is right? Does a Christian not believe that Christian behaviour is the best path to follow? In fact, it is only the Western secularist who believes that all cultures are equal. So the agenda is biased from the start. Or come at it through the religious route. ‘All religions are of equal value’, we are told. But how do you define ‘religion’? You cannot just say, for example, that religions are about belief in God or gods. Many Buddhists do not believe in divine persons. A Christian missionary gave a Bible to an Indian Hindu intellectual. After he had read it, the man said: ‘I thought you said this was a religious book? As far as I can see it is not about religion. It is a particular interpretation of history’. So, in his own terms of ritual, etc., this man did not recognise Christianity as a religion. Now, how does the politically correct agenda define religion? Basically it defines it as anything that is not Western secularism. It will not include itself. This is pure bias. The multicultural agenda wishes us to believe that all faiths and cultures are equally valid. It does this out of a concern for human rights. But at the same time there are certain faiths and cultures which do not match or actually attack the human rights which the politically correct say they are seeking to uphold. Let me take two extreme examples simply to prove the point. During the 1930s, the philosophy of Nazism took root in Germany, with Adolf Hitler being swept into power. But Nazism, based on a version of social Darwinianism, believed that the Arian race was the ‘master race’ and that other races, like the Jews, were inferior. Nazism therefore promoted a culture of racism which led to the tragedy of the holocaust. Here then is a culture which opposes multiculturalism. For the politically correct to say that all people and cultures are equal is irrational and ludicrous if they include cultures (like Nazism) which say they are not. But it is not just Nazism which has such a view. The late radical Islamist Osama bin Laden took an equivalent position. Interviewed on the Arabic news station Al-Jazeera after the 9/11 attacks on the Pentagon and the World Trade Center in New York, he made clear his hatred of Western culture. Commenting on what he hoped the attacks really meant, he let out an elated cry, saying: ‘The values of this Western civilisation under the leadership of America have been destroyed. Those awesome symbolic towers which speak of liberty, human rights and humanity have been destroyed. They have gone up in smoke’. Notice what he abhors: liberty and human rights. He would see those, presumably, as a challenge to the absolute authority of Allah and therefore to be repudiated. Here, then, again is an attitude and (with extremist Islam) a culture which deplores another culture. How can such a culture sit rationally within an outlook which says that ‘all cultures are equal’? It cannot. Most multiculturalists, I think, would rightly reject both Nazism and bin Laden’s form of extreme Islam. But, if that is the case, it is plain that they are bringing certain criteria to bear in considering what is an acceptable culture and what is not. In other words, they are contradicting the idea that all cultures are equal. In considering different faiths there is a famous parable to which people often refer. It is the story of a number of blind men touching different parts of an elephant and trying to describe the animal. One reports his feeling of the tusk. ‘The elephant is solid bone’, he says. Another speaks of a sturdy flexible cylinder — the trunk. Another indicates a smaller, thinner appendage — the tail. Another speaks of a large high wall — the body. They argue with each other and contradict each other as to what the animal is like. But the king, looking on, tells them they are wrong to argue. They are all touching the same animal, but just different parts of it. ‘There’, says prescriptive pluralism, ‘you religious people have such contrasting ideas but you are all in touch with the same reality and therefore should acknowledge that each person’s point of view is equally valid.’ It all appears so reasonable. The multicultural / prescriptive pluralism programme assumes the position of the king. It is, therefore, very much a kind of imperialistic agenda. ‘We know what is right and you religious people must do as we say.’ In particular, religious people must give up believing or declaring that they have found universal truth. This is the arrogant claim of the politically correct. Once we step back and look at all this we see just how hypocritical the politically correct multicultural programme actually is. This is because it is actually itself guilty of all the things of which it accuses the religions (and especially Christianity). It is biased. It is biased towards Western secularism. It is irrational. It says that all cultures must be treated as equal, when it clearly would reject cultures which reject common human rights. It is imperialistic. It decries those who proclaim they have universal truth, but at the same time it says that all must bow to its agenda. 1. The Gospel in a Pluralist Society by Lesslie Newbigin, SPCK, 1989, p.9. This article is an edited extract from Christians in a PC World by John Benton, recently published by Evangelical Press (ISBN 978 0 852 349 120, currently on sale at £7.64). (This article was first published in the June 2013 issue of Evangelicals Now. For more news, artciles or reviews, subscribe to EN or contact us for more information. Sometimes when I finish reading a book the ideas in it haunt me — the narrator’s voice echoes inside my head. I wish that I hadn’t finished it because it has been such good company and everything else I have to read doesn’t feel as satisfying. I have just had that experience on finishing this book. So why my enthusiasm? 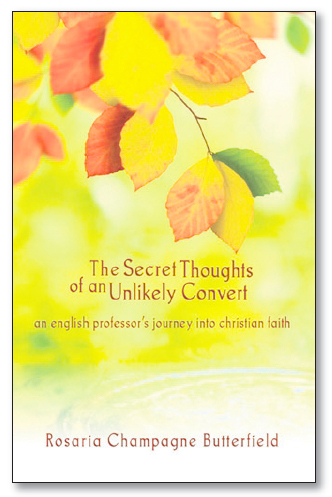 It’s not the title — although the by-line, ‘An English professor’s journey into Christian faith’, appeals to me. It’s not its slick presentation or that it has a clear target audience — in fact I’m not sure who the target audience is because it ranges across and through so many themes. The title actually describes it well — ‘secret thoughts’ — and the reader is taken into the mind of a perceptive and articulate woman who loves God, but her journey has been anything but conventional. The book opens with this declaration: ‘When I was 28 years old, I boldly declared myself lesbian. I was a teaching associate in one of the first and strongest Women’s Studies Departments in the nation’. She considered Christians bad thinkers and anti-intellectual, but they also scared her: ‘Here is one of the deepest ways Christians scared me: the lesbian community was home and home felt safe and secure; the people that I knew best and cared about were in that community; and finally, the lesbian community was accepting and welcoming while the Christian community appeared (and too often is) exclusive, judgmental, scornful, and afraid of diversity’. This book shows how God brought her to himself through the loving and gentle friendship of a pastor and her devouring of the Bible. It was not an easy transition; she refers to her conversion like experiencing a train wreck, as she moved from radical feminism to being married to a pastor of a Reformed Presbyterian Church (unaccompanied psalm singing). Yet this book is so much more than the story of her conversion, albeit a powerful witness to the way God transforms the most unexpected people. It looks at issues of sexuality and witness to the gay community, but it is not a book primarily about the gay issue, although it is worth reading for that alone. This book shows a person working out their theology having come to church as a total outsider for whom everything must be questioned and grappled with. It looks at what it means to be part of a church, relationships in church, the value of worship, hospitality, and serving others. She examines the principles of Christian marriage, and is a passionate advocate of adoption, fostering and home-schooling. She discusses Bible reading, hermeneutics, worldviews and education. Her perceptions are sharp, witty and thought provoking, I don’t agree with all of her conclusions (if I did I would be in a psalm-singing church), but she makes poignant and pertinent observations. I could quote on and on. Reading this book felt like finding a friend. Like all good friends there is room for disagreement, but, like the best friends we have, there is much to learn. Rosaria defies easy categorisation but I believe this book, despite its American context, has much to teach us — and not least how to share the gospel with our gay friends. His wife stops believing in Christ and backs out of church. One such pastor’s wife shares her story with Mary Davis for EN. EN: Take us right back. What were your early experiences of the Lord? PW: Although only one of my parents was a Christian, I was a well taught child, through church and by nightly family prayers. I had religious thoughts, even remarkable answers to prayer which impressed me enormously. As a teenager, I went to a women’s Bible study group and I gradually realised the girls knew the Lord in a way I didn’t. One day, I understood for the first time what Jesus’s death meant for me — that my own sins could be forgiven and I need not fear meeting God on judgment day. Soon after, I went to university and got involved in the Christian Union straight away. EN: Would you say that your faith then was genuine? EN: But you started drifting away from the Lord. What happened? PW: I was very tired from juggling family and church. My husband and I had been close in our early years, but we drifted apart because of the pressures on us. We have very different personalities and the differences were highlighted by poor communication and lack of time together. 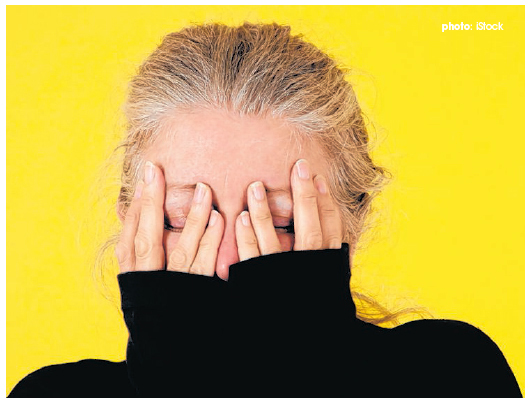 I became lonely and disillusioned with my marriage, and thought things would never change. With my husband often absent, I felt like a single parent — dealing with parenting issues on my own. Having married young, I hadn’t had a career. I felt a lack of personal fulfilment. Also, my mother’s death caused further emotional trauma and tiredness. I ended up totally overwhelmed and hopeless, and felt God was doing nothing to help me. Worse, I blamed him for putting me in a position where I had to accept everything and couldn’t complain. As a pastor’s wife, you can feel obliged to endure anything so as not to jeopardise the Lord’s work. I now realise the Lord was there all the time, but I’d stopped looking to him. My personal prayer life and daily Bible reading had vanished under the relentless daily routine and, with it, my vital lifeline to God’s presence and help. If I have just one message from all this, it must be: ‘Above all else, guard your heart, for it is the well-spring of life’ (Proverbs 4.23). EN: Where did you look for direction? PW: I went back to work, which brought me some success and satisfaction. Despite God’s kindness in this, I was very rebellious towards him. I became so angry and hopeless that I consciously gave up my faith. I’m not sure whether I turned my back on God (but still believed in him), or decided there was no God. At first I think it was the former. However, as I continued to ignore him, I didn’t like the bitterness and hardness I saw in myself, so I tried very hard to believe that God didn’t exist. Rather than being bitter because God had deliberately sent me so many troubles, I tried to believe that ‘these things just happen’, so bitterness was irrelevant. EN: Why did you stay in the marriage? PW: I think God used several providential factors to ‘hedge me in’: health problems, fear of hurting our parents and, perhaps, most of all, my maternal instincts that didn’t want my children’s lives to be damaged. I stopped going to church. I tried to keep up appearances for a while — but I felt such a hypocrite and so miserable that my husband finally suggested I stop going. It felt terrible at first, and I rather thought the sky might fall in, but it didn’t. I’m not sure we managed the process well. We kept it quiet, which was probably a mistake, as my husband didn’t immediately get the support he needed (though he later confided in friends). We dropped out of Christian society as a couple. Busy urban life, or perhaps embarrassment or sensitivity, meant that most people left us to it. EN: Looking back, what do you think was going on in your life and heart? PW: To be truthful, I hadn’t thought about it much before now. I believe the Lord kept me, even though I was consciously rebelling against him. He graciously prevented me from wrecking my life and the lives of my family. He graciously guided me in my working life and things I learnt then were later wonderfully ‘recycled’ in family experiences. I wonder whether I was a ‘lost sheep’ or a ‘prodigal daughter’? Perhaps an amalgam of the two? Looking back, it seems to me that the Christian life is much more personal and complex and challenging than I realised in my youth and I think young believers ought to be taught that the Christian life is a journey, not a one-off conversion event with a plateau-like experience after it. I guess that is the vital message of Bunyan’s Pilgrim’s Progress. EN: You were ‘away from the Lord’ for 14 years. What brought you back? PW: The immediate event was the astonishing conversion of one of our children. He had left Christianity in adult life, causing me major spiritual discouragement. But God saved him and changed him. During my years away, I thought constantly about issues of faith. I read lots and listened to debates, but found secular answers increasingly unsatisfactory. They didn’t seem to go the heart of the matter. The problem of evil had always troubled me — but there was also the ‘problem’ of good. Where did it come from? And there was personal morality. I didn’t like the darkness and lovelessness developing in my own heart without God. It seemed to bear out the truth of the gospel. Our marriage was gradually rebuilt. Through many pressures in our family life and my work life, my husband was a tower of strength to me. His kindness and support warmed my heart towards him in love and gratitude and the Lord gave us opportunities to rebuild and strengthen our marriage. Christian friends let me pour out my feelings to them — and it was often what they did which helped and impressed me, their unconditional love, the way they lived, rather than what they said or believed. Regardless of their faults, they seemed to have a quality of life that was undeniably more loving and selfless than unbelievers — though I had some kind unbelieving friends too. All these things, including, I’ve no doubt, many prayers for me, played a part in my eventual return to faith. EN: Do you have any advice for young couples in the ministry — or couples in general? PW: God’s timescales are longer than ours. My husband and I could easily be another statistic of a broken marriage — it would have been easy to give up. I claim no credit — as I said, I think I was prevented from leaving. Working through issues and growing in knowledge of one another, and, most of all, knowledge of God and his ways, has brought solidity and depth to our relationship. So I would urge couples to persevere and not give up. The Bible stresses the importance of patience — the thought of God’s patience with us should make us patient with one another, in marriage and other relationships. He has loved us so patiently and faithfully when we didn’t deserve it at all. It is hard to be patient, sometimes heart-breaking, but God’s ways are so different from our ways and they genuinely work best. Young ministry couples need to make sure they give quality time to their own relationship and don’t take one another for granted. I think the Devil especially targets ministry families — it is a no-brainer that, if he can destroy the leaders of the church, he will greatly forward his own purposes. Churches should especially pray for their pastors and their families and not think they are ‘super-Christians’. EN: What would you say to a Christian whose spouse is drifting spiritually? PW: Don’t lose hope, the Lord can bring them back — ‘He is able to save to the uttermost’. Keep praying. If they have had a deep Christian faith, there will be a continuous struggle going on in their minds. They may be thinking a lot about spiritual things, even if they don’t admit it to you. God can use anything in their lives to speak to them. I did a scientific course in my leisure time and was amazed at the complexity of the structure of a single cell. It made me think there must certainly be a God because believing that such organisms could just invent themselves strained credulity too much. EN: What have you learned about the Christian life through all this? PW: God’s grace is so much greater than I ever imagined, his love for me is always there, and I can rely on him in all situations. I’ve also realised, a bit late in my Christian life, the importance of praying about everything. I’ve found — wonder of wonders — that God is as good as his word! Daily answers to prayer not only strengthen your faith but give you a growing sense of God’s love. I’m also learning it’s not all about me, but about what God wants for me. Most of all, I’ve learned that God’s ways are both very mysterious, and also very merciful, and I love him for it. 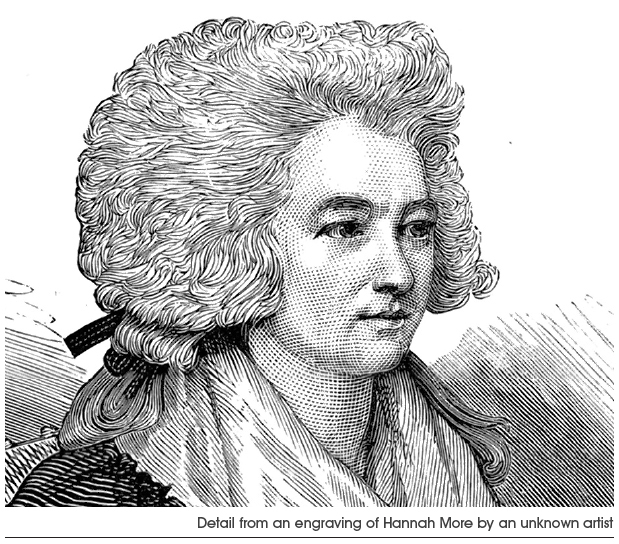 Hannah Moore, one of the most influential evangelical women of the 18th century, introduced. Imagine that a friend of yours becomes a Christian. What would they have to change? Friends? Career? What they watch or read? How would you help them make those decisions? You might think that conversion today is so complicated and the costs so great that examples from history are irrelevant. Hannah More, however, was an 18th-century woman who wrestled with such questions, leaving us a legacy of wisdom and courage from which we can still learn today. Hannah was born into the turbulent 1740s and her situation was unpromising. England was at war with France, public life was decadent and the established churches largely stagnant. Her father had missed out on an inheritance and so had forfeited the genteel life of a clergyman he was aiming at. Instead, he eked out a living for his expanding family as the only schoolmaster of a village school outside Bristol. His precious collection of books had been lost on a sea voyage. Hannah was the fourth of five sisters, doted upon by all, and precocious even by the standards of her talented siblings. Her father taught the children at home, and Hannah received special attention by being singled out to learn some Latin. Their father didn’t, or wouldn’t, provide more than this; the girls were not entitled to anything approaching a boy’s education. Hannah later wrote: ‘I, a girl, was educated at random’. So the sisters, with great resourcefulness, left the cramped schoolhouse to make their way, starting a school for girls in up-and-coming Bristol. The school was the More girls’ passport to social status and financial stability. Hannah started as a pupil, but, by the age of 18, she was a teacher. As they were so young, Hannah and her sisters enjoyed great companionship with the pupils and were also able to play host to local dignitaries, from theatre directors to the MP Edmund Burke. She met an older landowner to whom she became engaged, but, after he had postponed the wedding three times in a six-year period, she was glad to accept a dissolution of her promise and an annual sum. What was in part a great blow, turned out to be Hannah’s great opportunity. Freed from the necessity of earning hard cash, she could pursue a literary career. In an age where the novel had barely got going, theatre was the place to tell a story. And so Hannah travelled to London, took up lodgings near the great actor-manager David Garrick, got invitations to parties and made herself indispensable. Her strategy was so successful that in a period of three years she went from unknown to being the favourite of Samuel Johnson, the great dictionary writer, and semi-permanent house-guest of the Garricks. She was painted by society artist Joshua Reynolds and became part of the famous Blue Stockings Society, a group of female thinkers and writers. Three plays of hers were published and performed countrywide, a remarkable achievement for a woman from such a humble background. But then, in 1779, her great friend and protector, David Garrick, died and a disillusion with the theatre and London set in. She became companion to Garrick’s widow for five years, living an increasingly retired life until she moved to ‘Cowslip Green’ in Somerset, away from the dazzling talent and squalor of London. And that’s where it could have finished; Hannah More, a footnote in 18th-century literary history. But, during those years in the capital, Hannah met Bible Christianity. Hannah had always been a God-fearing girl. She was brought up in a pious home and at school the More sisters were known for their ‘excellent principles’. And, although Dan Cruikshank tells us that London in the 1700s was ‘a vast, hostile, soulless, wicked all-devouring … fatally attractive place’, Hannah kept company there with conservative churchgoers. But that respectable religion was not enough to satisfy the spiritual hunger Hannah felt. She wrote: ‘The more I see of the “honoured, famed and great”, the more I see of the littleness, the unsatisfactoriness of all created good; and that no earthly pleasure can fill up the wants of the immortal principle within’. A friend passed her the poetry of William Cowper (‘A poet whom I can read on Sunday! I am enchanted!’), she began Matthew Henry’s Commentary and took away pockets full of sermons from John Newton’s church, St. Mary Woolnoth. Gradually Hannah turned from the confines of respectable religion to the find peace with God through faith alone. So then, what was Hannah to do? She had moved from the distraction of London, but that was not enough. ‘ To seek a retreat till we have got rid of [this] ambition … will only conduct the discontented mind to a long train of fresh disappointments’. So, first of all, she continued the networking which had brought her own promotion. Throughout her life she deliberately sought out the company of those who would do her good, or to whom she could do good. She corresponded with John Newton and was a close friend of William Wilberforce and the rest of his ‘Clapham set’, those evangelical Anglicans at the forefront of applying the gospel to society. She knew the Wesleys and maintained contact with a number of bishops. Hannah took up the causes of downtrodden individuals and groups, campaigning against slavery for the rest of her life. At the same time she cultivated friendships with the minor aristocracy and kept up letter-writing to some of the cynical London set, longing to see them come to faith. Then there was writing. If Hannah had been busy as a secular playwright, she became a whirlwind in the service of the gospel. From plays telling the Bible stories which were translated by missionaries round the world to books presenting the gospel to the upper classes, she wrote year in, year out. She tried novels commending the virtues of simplicity and chastity, and a great volume of tracts. Her works were far more widely read than those of Jane Austen and exported in great volume to America. Even at the end of the 19th century her books could be found on the shelves of serious families in the US. Many of these works now seem quaint and dated, but they achieved great things in their time, and the works directly on spiritual matters are still forceful and resonant today. After writing came organising. When William Wilberforce said in 1789 that something must be done for the impoverished and neglected villages of north Somerset, Hannah and her sisters took action. They went to the small agricultural and mining communities and established Sunday Schools, employing Christian teachers and eventually running savings clubs for mothers and evening classes for parents. The aim was to bring the influence of the gospel to places full of poverty and disorder so that lives could be saved and society changed. Such a huge undertaking took great organisation and fund raising and, in this, Hannah was tireless. Her involvement lasted to her death in 1833 and brought much trouble and distress as well as great reward. Of course Hannah was not without flaws and did from time to time make poor decisions which hampered her work, but she was also repeatedly attacked. Her intense work and these public disputes caused quite regular breakdowns in Hannah’s health. She would retreat to her bed with what now looks like bouts of depression or extreme fatigue. After her death her legacy has been blighted by accusations of paternalism, anti-feminism and being, quite simply, a bad writer. The Victorian politician Augustine Birrell said that she was: ‘One of the most detestable authors that ever held a pen [she] flounders like a conger-eel in a dingy sea of morality’. How sad that such a courageous woman should have got the reputation of being a small-minded spoilsport and a lecturing busy-body. Hannah More was a strong-minded and ambitious woman whose life is well worth study. Her example calls us to use all our gifts, energies and relationships for the glory of God. As she wrote in Practical Piety: ‘We must, while we keep our hearts humble, keep our aims high… As God is unlimited in goodness, he should have our unlimited love. The best we can offer is poor, but let us not withhold that best’. Sarah Allen is a secondary school English teacher and mother to five children. She is currently involved in evangelism and women’s work at Hope Church, Huddersfield, where her husband Lewis is pastor. This article was first published in the May 2013 issue of Evangelicals Now. For more news, artciles or reviews, subscribe to EN or contact us for more information. How should the church react when the state seeks to take away the liberties of others? Or when the state impinges on the freedom of churches to preach the truths of the gospel? These are the questions which lie at the heart of Bonhoeffer: Pastor, Martyr, Prophet, Spy, a biography by Eric Metaxas. I confess that before embarking on this book I knew very little about Bonhoeffer. Bonhoeffer ministered as a pastor and theological educator in Germany during the turbulent years between the world wars. Leaderless democracy — in the form of the Weimar republic — had been imposed on Germany by the victors of WWI, along with harsh reparations and prohibitions. A resulting desire for strong leadership and the restoration of national pride played a large part in the (legal, democratic) rise to power of Adolf Hitler. Bonhoeffer developed into a brilliant theologian following the neo-orthodoxy of Karl Barth rather than the theological liberalism which prevailed in the academy. Some today might rightly question some aspects of his theology; he, like us, was a product of his time. 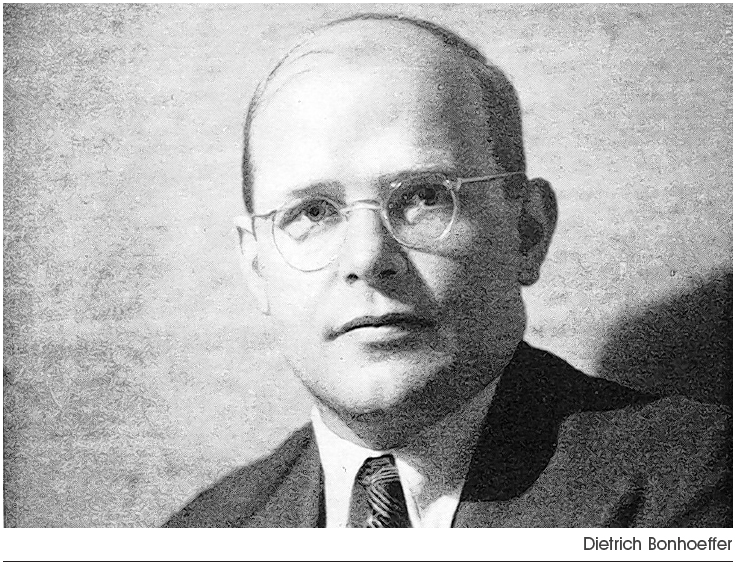 Partly through the influence of his scientist father, Bonhoeffer was gifted with a deep sense of the power of ideas. Metaxas writes: ‘For Bonhoeffer, ideas and beliefs were nothing if they did not relate to the world of reality outside one’s mind’ (p.53). Connected to this, God also gave him an amazing prophetic gift: he was able to anticipate the direction society was moving in, and the likely long-term implications. Bonhoeffer’s ministry was varied. As well as playing a key part in church politics for a number of years, he served as a lecturer in Berlin, a pastor in Barcelona and London, and a theological educator in various places around Germany. Having joined a failed plot to assassinate Hitler, he was imprisoned in 1943 and executed in 1945, just weeks before the end of the war. Bonhoeffer’s significance in the history of the church mirrors the rise of the Nazis from minority ruling party to world war-mongers. I found it truly terrifying to observe again how a ‘civilised Westernised state’ could be taken over in this way in just a few years. As an exercise in accumulating raw power, Hitler’s approach was quite simply brilliant — manipulating public opinion to bring about his own agenda, complimenting the church when it suited him, while all the time despising the ‘weakness’ of Christianity and biding his time before seeking to destroy the church altogether. The book explores in detail one of the greatest tragedies of that period of history, a tragedy which greatly exercised Bonhoeffer. This was the way in which the church was divided, and rendered virtually impotent. Two issues lay at the heart of this crisis. The first was the willingness of some — the ‘German Christians’ — to twist the teaching of Scripture to accommodate Nazi policy: in particular as regards their attitude to the Jews. Within months of coming to power, the Nazis introduced ‘the Aryan paragraph’ — resulting in the insistence that government employees must be of Aryan stock (pp.150-151). The German Christians went to extraordinary lengths to justify the Nazis’ position: they removed the OT, and ‘quoted NT passages out of context and twisted the meaning to suit their anti-Semitic agenda’ (p.172). The lesson, of course, is that theological liberalism will do whatever it can to accommodate what the state or public opinion wants it to say — whether that is moving the state in a more repressive or ‘progressive’ direction. This tendency is particularly acute for those in the established church. An established church is fine when there is a common opponent — as was the case during the Reformation. But the dynamic becomes very different when the state tries to coerce or influence the church. It was out of this dilemma that, in 1934, the Barmen declaration was made, and the (theologically orthodox) Confessing Church was born. However, even the Confessing Church struggled to counter the threat of the Nazis — this time because of a failure to define the limits of the state. For example, in 1935 the Nuremberg laws were announced — among other things forbidding marriages of Jews to German citizens (pp.279-280). Metaxas tells us that Bonhoeffer saw an opportunity to speak out — ‘but the Confessing Church was again slow to act. It was guilty of the typically Lutheran error of confining itself to the narrow sphere of how church and state were related’ (p. 280). Luther was highly respected as the spiritual father of Christians in Germany, but Bonhoeffer felt that Luther had overemphasised Romans 13.1-5, in the sense that he had ‘never been forced to deal with the boundaries of the scriptural idea of obedience to worldly authorities’ (p.281). Bonhoeffer took a very different approach to the role of the church in an unjust state. He argued that, while the state is given authority by God for the preservation of order, the church has a role to ‘continually ask the state whether its action can be justified as legitimate action of the state, i.e. as action which leads to law and order, and not to lawlessness and disorder’ — or indeed ‘excessive law and order’ (p.153). In particular, the church must reject any attempt by the state to ‘deprive Christian preaching and Christian faith… of their rights’ — precisely because of the church’s ‘better knowledge of the state and of the limitations of its actions. The state which endangers the Christian proclamation negates itself’ (p.153). Indeed, part of Hitler’s agenda was to change the churches, so that they were his agents in carrying out his agenda. The church must always resist this attempt. Beyond this questioning of the state, Bonhoeffer advocated two further actions on the part of the church: aiding the victims of state action (including those who don’t belong to the Christian community — in this case, the Jews); and, when necessary – when the church sees its very existence threatened — putting a spoke in the wheel to stop the vehicle of state (which, for Bonhoeffer, included the assassination attempt on Hitler) (p.154). In the end, Bonhoeffer lost faith even in the Confessing Church. Rather than engaging in church politics, he devoted himself to a life of discipling and training new pastors, pastors who would have the same commitments he himself had, many of whom would ultimately end up in prison or sent to their deaths on the front line. When war started and his role was declared illegal, he became an official spy working for the Abwehr, and unofficially joined a plot to assassinate Hitler. Until, that is, Bonhoeffer himself ended up in prison and was executed. If he were with us today, what would Bonhoeffer have to say to the churches of Britain? Probably something along these lines: ‘Be united. Stand for the truth before it’s too late. Don’t give more ground to the state than the Bible permits. Keep questioning the state, and holding it to account. Care for the persecuted (Christian and non-Christian). Train more people who will do the same’. Where would Bonhoeffer draw ‘the line in the sand’ as regards our current struggles? He’d probably say we’ve already passed it. But he’d certainly encourage us to keep making a stand, and to keep taking action — remembering that a church divided is a church destroyed, and a church which fails to engage with the issues of the day is a church irrelevant. In the final analysis, Bonhoeffer would say that if truth is truth, it is worth dying for. He had a clear sense very early in his ministry that he would have to pay the ultimate price. And yet he continued — boldly, confidently — towards his destiny. He regretted nothing. And here we are, discussing books about him today. 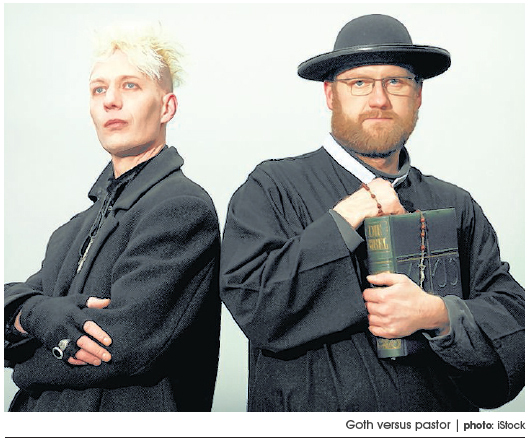 Steve Wilcox is an Anglican vicar in West Hull. In February, Cardinal Keith O’Brien resigned as leader of the Scottish Catholic Church. His resignation followed allegations that he had made inappropriate sexual approaches. Cardinal O’Brien has publicly apologised and admitted his misconduct. This is the latest in a series of scandals to engulf the Roman Catholic Church, the most serious of which has been the past concealment of clerical sexual abuse. However, there can be no place for complacency among evangelicals. Every year ministers and elders tragically fall into sexual or financial sin and leave the ministry. Some allegations against church leaders are not taken seriously, and in some cases known failings are hushed up and ministers allowed to resign quietly so as to ‘protect the reputation of the church’. Occasionally leaders have resigned from one ministry and gone on to serve another church, or organisation, which may be utterly unaware of what has gone on. The proper handling of the sins of church leaders, and allegations made against them, is a vitally important issue. 1 Timothy stipulates not only the qualities and gifts required of leaders, but also provides guidance as to how to address any allegations: ‘Do not entertain an accusation against an elder unless it is brought by two or three witnesses. But those elders who are sinning you are to reprove before everyone, so that the others may take warning. I charge you, in the sight of God and Christ Jesus and the elect angels, to keep these instructions without partiality, and to do nothing out of favouritism’ (1Timothy 5.19-21). A number of key principles emerge here which apply not just to leaders, but to all in the church. Paul is clear that there can be no place for the na?ve assumption that church leaders will never fall. Gifted and respected leaders are not above temptation and deceit. If someone makes allegations about a church leader, they cannot be dismissed simply on the basis that ‘it couldn’t be true’. Such allegations must be taken seriously and properly investigated. This is essential both for the protection of the person making the allegation, the accused leader, and the wider reputation of the church. These verses, as well as the other New Testament passages, make clear that when allegations are made the church has to act as a court. This may seem overly formal to those who view the church only as a warm family gathering. But Paul emphasises to the Corinthians that, because they are indwelt by the Spirit of Christ, they have the capacity and ability to make judgments, so that they can resolve disputes internally (1 Corinthians 6.1-11). His concern is that the church should conduct a proper investigation into allegations made, judge whether they are well founded, and take appropriate action. Many problems in churches are left unresolved because of the failure to undertake this ‘legal’ function. It is far better to anticipate such problems, and to have a clear procedure to follow before allegations are made. In the case of employed church staff this ought to be a part of their contract or terms of office, and the church should have a clear disciplinary procedure identifying the process that will be applied, and who will be responsible for undertaking it. Similar provision ought to be put in place to handle allegations that might be made against volunteer leaders and church members. The church Constitution and Rules ought to lay down how church discipline will be administered. This may seem unduly heavy-handed, but the worst time to be considering how an allegation should be handled is on the hoof after it has been made. The adoption of proper procedures in advance prevents arbitrary, rushed or biased decisions. Policies and procedures ought to be written down and available for all to see. An accurate written record of everything that is alleged, and of the subsequent process that is followed, should be kept. The fact that the church possesses both the jurisdiction and capacity to make judgments in this way does not mean that there are no circumstances in which allegations against church leaders or others should be passed to the civil authorities for investigation. In the case of allegations that raise concerns that children or vulnerable adults may be in danger, there is an obligation to inform the relevant child protection authorities. Every church ought to have a proper child protection policy in place, making clear when it is necessary to refer matters to the authorities, and identifying a child protection officer who will be responsible for assessing such allegations and making the decision whether to refer to the authorities. Organisations such as CCPAS provide clear and accurate guidance for churches in this regard. There is no general obligation to refer alleged criminal behaviour to the police unless children or vulnerable adults are in danger. An allegation of sexual assault against an adult, for example, does not have to be reported, and it is primarily a matter for the complainant to determine if they wish to involve the police. However, those to whom such allegations are brought should certainly advise the complainant of their right to go to the police, and in some cases may feel that it is necessary to report the matter themselves. Those to whom allegations are brought should never, under any circumstances, offer or agree to grant confidentiality to the person making an allegation. The appropriate person to whom to report an allegation, and who will investigate it, will vary. Where a church belongs to a denomination, systems will probably already be in place. It is often more difficult in independent churches that have no external accountability, since the responsibility may fall to the other elders or deacons, or to the congregation. It may be difficult for them to investigate a leader who ordinarily exercises authority over them. One of the advantages of membership of a body like the FIEC is that help and advice is available. One of the most significant difficulties is that someone who has an allegation to make may not know who they should contact, or perhaps feel too intimidated to speak up. It should be clear to everyone who they should go to with any allegation. Church business meetings are a good opportunity to remind church members of the procedures. Where an allegation is brought against a leader, and it is not a matter which is passed to the police or other civil authorities, then it must be properly investigated. This ought to be done quickly and comprehensively. A church leader may need to be suspended from duty pending the outcome. Allegations cannot be entertained if they are made anonymously. Leaders are not to be judged purely on the basis of gossip or rumour. Paul insists in 1 Timothy 5.19 that an allegation must be supported by adequate evidence. This requires multiple witnesses to what had taken place. Solid reliable evidence is necessary. This will require caution where there are allegations that inappropriate conduct took place, which might be capable of another interpretation and no other witnesses can corroborate. However, multiple allegations of similar conduct will prove compelling, as was the case with Cardinal O’Brien. This requirement of adequate evidence is a necessary protection for church leaders. The Bible demands that we operate the principle of innocent until proven guilty. We need to be aware that people do make false or mistaken allegations. In all cases the accused person ought to have full opportunity to answer and explain. Where allegations made against a church leader are substantiated, then it is wholly inappropriate that they should be hushed up by means of a quiet and unexplained resignation. Such concealment is neither helpful for the individual concerned, nor for the church. It also fails to protect other churches or organisations if that person seeks to minister in the future. Paul makes clear in 1 Timothy 5.20 that, in the event that a church leader has been found to have sinned, they should be rebuked before the church, so that everyone is aware of the circumstances. This does not mean that the church necessarily needs to know all the specific details, but they ought to be informed of the substance of the sin, and the action that has been taken as a result. In many cases this will inevitably result in a leader being disqualified from ministry, even if there is genuine repentance and forgiveness. Even where a church leader chooses to resign immediately allegations are made, a proper investigation ought still to be undertaken, and the church informed of the outcome. Where an allegation has been made and been found to be unsubstantiated, the accused ought to be publicly vindicated. As long as we live in a fallen world it is inevitable that churches will have to deal with such situations. The overriding principle ought to be to do what is just and right so as to bring glory to God. God is not honoured, and the reputation of the church will not be protected, by concealment. While this article has concentrated on how we ought to handle allegations of misconduct, it is equally important that we take steps to try to protect church leaders from temptation and falling into sin. Ministry is often lonely, and this can lead to added pressures that result in particular vulnerability to sexual and financial sin. Churches need to try to ensure that their leaders enjoy loving and supportive accountability, and that there are those to whom they can, and do, turn to share their struggles and temptations. They need to make sure that they are properly paid and not overworked.